I wish Dollar General would hire me to blog. Whenever I stop by for generic children's Tylenol, I find another deal worth stockpiling. 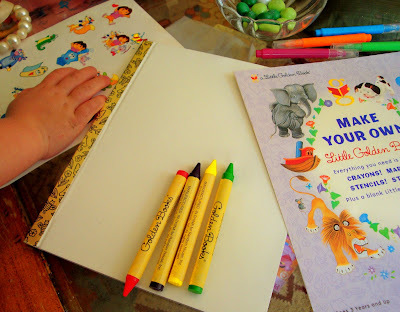 These Make Your Own Little Golden Book kits cost only $1. Our Dora version came with stickers, crayons, markers and, of course, a blank book with the signature gold spine. Now that's a party favor worth giving. I love it. I will be searching for a DG near me to get these. My gift closet wants them desperately! Dollar General stores are not like Target, particularly in the book section. What you see in one store may not necessarily be in another store, and not everything in the store itself is a great deal. But I check on Amazon, and these book kits are priced there at $5, so it is worthing taking a look if you happen to be in a DG nearby. Excellent! I'd love to give as gifts. ONE IMPORTANT THING THAT II MISS ABOUT THE SOUTH IS DOLLAR GENERAL! I miss that place - different DGs carry different items - that's what makes it great and unique! My daughter had a Dora themed birthday once and those would have been perfect. Did they have other characters or (preferably) non-character versions? at our supermarket, Stop & Shop, of all places. my daughter got one of these for her birthday. I thought it was the cutest thing I've ever seen. I had no idea it was only $1! Wow! Now THAT is very cool. Thanks for the head's up! That was a real bargain! Are you giving these as party favors for Elise's birthday (that is coming up soon, I believe)? Is she having a Dora-themed party or did you get various characters? How exciting to be able to plan a little girl's birthday party! I think I would enjoy that as much as Melissa at A Little Loveliness does! She always gives the sweetest parties for her children. Hope your little ones are feeling better. I love this idea. I'm going to have to find a Dollar General and see if they have any boy-themed book kits. Very neat! I'll have to look for some of these. They would make great rainy day activities for the girl. I love to live pretty - and now realize that it does not take much money to accomoplish the best in this life - You've helped me in that endeavor! My girls received these for Christmas..they are so fun!! !I wanted to make one! What a great find! Perfect for a party favor...great idea! I saw these 5 years ago at walmart for 3.99-so you did find a good deal! I just bought these books last week & my kids LOVED them!! Oh now that is really cool! I just finished stuffing my daughter's treat bags for school tomorrow. Those books would have been much more useful and a lot less work! Good one for the present box! I love Dollar General too. Thanks for the head's up - hope our DG has these. We've got 3 birthday parties coming up this month that these would be perfect for. That is so cool! I'll have to run into the DG near me to see if I can find them. My kid's a little young now but for $1, I would store these for awhile! Those are so cute. Thanks for sharing your find. I will be on the lookout for those adorable books. What a cute idea! I loved my Little Golden Books as a child. I can see lots of fun ideas with those nostalgic kits! That was what I usually spent on a party favor (when I did them, I'm not a big believer of party favors) ... $1. Now THAT is cool. There is a stop at Dollar General in my very near future. Thank you!! What a great deal! Our family collects Little Golden Books. In fact, I have a basket of them between the kiddos in the car to keep them entertained. I will have to check our store because that is a wonderful gift! What a great find! And yes, that is a party favor worth giving - I think my general objection to them is that they usually aren't worth giving. great!!!! I'll have to stop by tomorrow during my lunch break. Thanks so much for sharing such a wonderful find! Great idea! We do something similar by altering thrift store books and turning them into scrapbooks! It's really fun! YOU ARE JOKING! I haven't ever seen these before and seem to be tripping out a bit about them and feeling like I need to go and look RIGHT NOW to see if our store has them. Breathe, breathe, breathe...OK, now I have to go! what a cute idea!! i will forever love golden books.